Today, the defense will give their closing arguments in the Zimmerman Trial before the case goes to the jury. Dan appeared on Good Morning America this morning to discuss the effectiveness of the Prosecution’s closing argument. Dan says, “Two key issues: emotion and inconsistencies. And emotion is really the most important one, which is, they’re basically saying, if it weren’t for the actions of George Zimmerman, Trayvon Martin would be alive today. That’s not a legal reason to convict him, but that’s an emotional one. And number two, with the inconsistencies and I think in particular, an inconsistency with regard to how he would have gotten the gun. Prosecutors essentially saying, he’s not telling the truth, that it’s at the last minute he’s getting beaten up and he grabs his holster and tries to pull the gun out. The consistencies are very important. As a legal matter, they’re important. 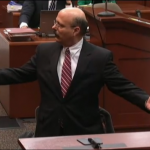 They’re hoping that the jurors will ignore all of the statements made by George Zimmerman.” Watch the segment on here.